rodeasdown.com.au – They understand colour and movement. They don’t understand customer support. They understand colour and movement. They don’t understand customer support. It sounds like a neat idea. Triangular LED panels presenting a full palette of colours, solid or blinking, to mount on the wall. 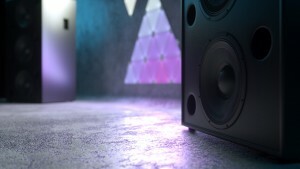 Even better, add a plug-in and the panels pick up the beat of whatever music is playing and synch with it. Pop and Hip-Hop work best, classic not so much. The panels are most sensitive to voices. 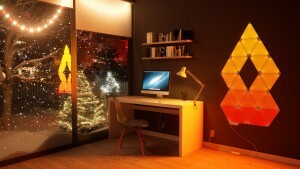 But Nanoleaf’s Aurora is only neat if you ignore the customer experience. Mine was surprisingly, unfathomably frustrating. 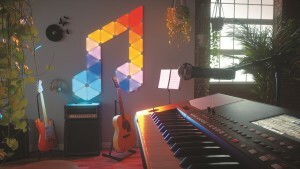 Nanoleaf’s Rhythm package provides nine equilateral triangle panels (25 cm each side), the Rhythm sound-sensing plug-in and everything else necessary to get it pumping at an RRP of $349.99, the best discount I found was 99 cents. Open the box and there’s a ‘welcome’ leaflet, its first three pages in English. The first tells you what a clever purchaser you are, the second is a schematic showing how to join the panels – easy and intuitive – and the third is a troubleshooting guide that covers pairing to your Wi-Fi and phone or tablet (Android or IOS). That’s it for instructions. Nowhere could I find an explanation of the buttons on the plug-in controller. The on-off button is obvious but I still don’t know what the capabilities of the other one are, or what it means when the LED power telltale is slow flashing, fast flashing or solid. There’s a button on the Rhythm too. It also has a light that’s solid or flashes. The ‘welcome’ directs you to YouTube for set-up videos. Hello? Why aren’t these on the Nanoleaf website? I wound up with a cat-loving Canadian guy explaining how to unpack the box. Duh. There are lots of videos about Nanoleaf on YouTube so you have to scroll and click a lot to find the official company ones, and those I did find were of little help. 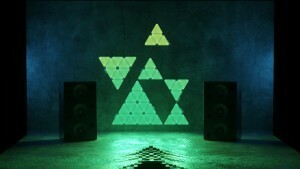 But wading through the dross I encountered lots of comments about Nanoleaf systems, all instructive. One guy said it took two days to pair his phone with one, another declared “This (official Nanoleaf video) told me nothing I didn’t already know. I need to know how to set them up. My app isn’t reading it.” So I guess I’m not the only one. The best advice the ‘welcome’ leaflet gives is to test your layout on a table first. I cannot recommend this highly enough. I composed a fish shape and got everything flashing (it takes a while to boot up), and I appreciated the very long power cord. And that the panels generate no heat. Everyone said ‘wow’, and then moved on. You know what? The novelty wears off pretty fast. For wall mounting you are provided with strips of sticky tape. For a more solid screw-mount there’s an additional kit which doesn’t seem to be offered at retail locally; online it’s $US25 plus $US13.86 shipping – about $50. Locally offered are packs of flexible links for transitioning your display through right-angles from wall to ceiling, or from wall to wall, for $29, and extra panels at $99 for three. Thirty panels is the max for a single display. Use the app to dial the brightness down and select a single, solid colour for a cool kids’ nightlight. Or maybe wall-mount panels to guide guests to the bathroom. They’re fun at a party, the Rhythm appreciates a big bopping bassline. Apart from that, well, you’d really only love an Aurora if you’re into casino chic. If I were given one for my birthday it would go straight to the pool room.